You are here: Home / Business Skills for Artists / How Much Does it Cost to Attend an Art Fair? 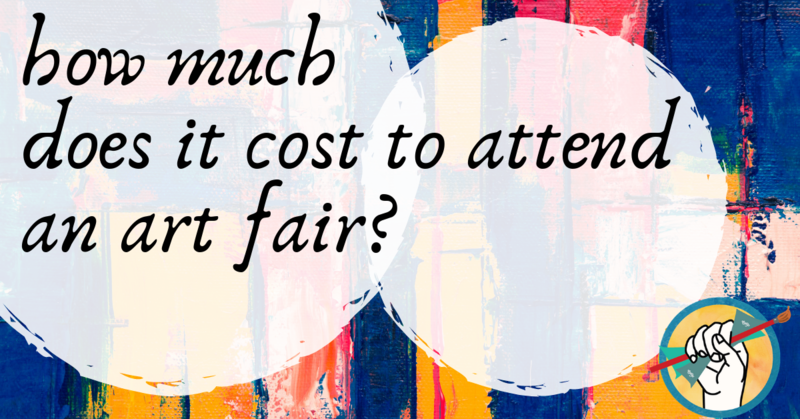 How Much Does it Cost to Attend an Art Fair? How much does the average art fair cost? Beginning to exhibit at fairs and shows is an exciting new step in your art career. So exciting, in fact, that it can be easy to forget about all the hidden costs and fees associated with it. We’ve put together this list of costs you can expect for the average local/regional art fair to help you be better prepared, so you can plan your budget accordingly and hopefully leave the show with a profit. We also asked for input from artists in The Abundant Artist Association on how much they tend to spend per show. Before you pay as much as an application fee, make sure that the show is a good fit for your artwork. Doing your homework up front can help prevent a lot of wasted time and money if the show is a dud or just not a good fit for you. Ask around: do you know anyone who has exhibited at this show? Do some Googling, and send emails or phone calls to artists who have exhibited. Do they advertise well, is the entry fee reasonable, is there ample parking? Is the show really about the artists, or is it more focused on music or food? Does the show cater to a certain art style or demographic? Still deciding whether the show is a good fit for you? Here are 10 questions to ask. This fee will depend on whether you are applying yourself, or whether a gallery that represents you is applying on your behalf. A gallery is likely to pay the application fee if they apply for you. Not all shows charge an application fee, but knowing for sure will obviously mean the difference for you between being considered or not, so pay close attention to the application instructions. $35-$50 is a fairly standard range to expect for an application fee. Some shows, like La Quinta, also charge a percent commission on all sales made at the show (La Quinta’s commission is 20%). Many art fairs allow or require a backdrop display like this one from Displays2Go for about $135. This is a one-time investment that would pay for itself quickly with the sale of a few prints or a single original, and will be useful whether the show is in a friend’s backyard or at a large regional exhibition. Tents and canopies can be a costly investment up front to the tune of $1,000+, but if art fairs are a proven part of your business model then it’s likely in your best interest to purchase one. For a first-time attendee, you’ll probably want to rent or borrow the larger elements of your display. Assuming you want to sell prints at the show, you’ll incur the up-front cost of purchasing or producing the prints. Unless you only bring prints that you already had in stock, prints will need to be factored into your budget. If you decide to use an online service to produce your prints for you, you have a lot of options with a wide range of prices. You can check out our list of print-on-demand options or our tutorial on how to create your own prints. This will vary by region. It’s wise to arrange your travel accommodations as far in advance as you can, particularly if it’s a larger show. Especially if you are new to exhibiting at art fairs, be sure to factor in the costs of your daily meals, parking, and larger travel expenses into your overall budget. Investing in a good, well-designed banner or poster and a stack of business cards is a must. We highly recommend hiring a graphic designer if you aren’t one yourself. How much do you spend per art show, on average? Did we leave out any hidden costs? Let us know in the comments! I’d like to buy Owen Garrett’s Ultimate Guide, but the 10-minute pitch for coaching is beyond annoying. There’s no way to skip it. Grrr.